Cloud Chasing is getting more and more popular. But what is “Cloud Chasing” actually? In the world of vaping, “Cloud Chasing” means a very artful way of vaping that is aiming to produce huge and artsy clouds of vapor. Some call it also “Stunt Vaping”, while others simply name it “Sub-Ohm Vaping”. Many vapers are always working meticulously on their atomizers and mods as they regard vaping not just as a hobby but even as a sport. There are even competitions where vapers with the best and most aesthetic clouds can win prizes of up to thousands of dollars. The contestants call themselves “Cloud Chasers”. The world of Cloud Chasing is a subculture that is becoming more and more attractive and is inspiring more and more people all over world. Battery safety: Be aware that your e-cigarette can catch fire by the misuse of batteries! Therefore, you should always use the safest batteries you can find, e.g. batteries by AW, Sony, VTC4/ VTC5, Samsung, LG and Panasonic. Don’t leave the charger unattended! Airflow: The right combination of resistance and airflow is the key to your success. The lower the resistance, the more airflow you need. But be careful: too much can dilute the vapor or dissolve it quickly, while too little cannot produce enough vapor. As a cloud chaser, you don’t only want large, but also dense clouds. That’s why it is quite tricky to adjust the airflow correctly without overheating the mod. The liquid: The liquid consists of a mixture of propylene glycol (PG) and vegetable glycerin (VG). For cloud chasing purposes, you should have a higher VG ratio, e.g. 90% VG and 10% PG. VG makes the liquid denser and that’s why bigger clouds can be generated. Keep in mind that flavorings can also dilute the vapor. Mod: It is crucial to use the right mod. To avoid possible explosions or even fire, keep in mind to invest in a mod which supports a very low resistance (sub-ohm). There are two kinds of mods: digital mods and mech mods. Cloud chasers mostly choose mech mods as they offer better ventilation. However, mechanical mods are not suitable for beginners. They require sufficient knowledge of battery safety and Ohm's law. Atomizer: For those of you wanting to participate in competitions, a Rebuildable Drip Atomizer (RDA) is an absolute must-have. With RDAs, you have to build your own coils, which are attached with a screwdriver. RDAs are also known as "drippers", because the e-liquids have to be manually dripped directly onto the coils. Of course, this method is time-consuming, but it is just right for cloud chasing, as you can produce quite homogeneous clouds. Inhale and exhale: Just like tricks with cigarette smoke, cloud chasing requires the right technique and a few months of practice. This includes an optimal body position as well as the correct inhalation and exhalation technique. For example, if you exhale too fast, the cloud will thin out. For large and dense clouds you should exhale slowly. Another tip is to move slightly backwards with your body when exhaling. Wicking: The right wicking is another important factor as it helps you to get out the most of your e-liquid. For this purpose, turn in a piece of cotton wool and cut off the ends slightly. Then push it between the coils. Make sure that you bend the ends downwards so that the cotton can absorb the liquid. Coils: When it comes to cloud chasing, it depends a lot on how you build your coils. Generally, the lower the resistance of your coils, the bigger the clouds get. Of course, all of the factors mentioned above also play an important role, but the coil is the core. There are atomizers with single or dual coils. Cloud chasers tend to choose dual coils as they can produce more vapor. Everyone can vape with sub-ohm tanks, but cloud chasing is just for the tough ones of you. Extreme sports always entail a high risk and this also goes for cloud chasing. However, if you keep everything in mind, it’s gonna be a lot of fun! If you are unsecure or do not know enough about battery safety and the Ohm’s law, it can be really dangerous. Therefore, it is essential to know which batteries go with low-resistance (sub-ohm) coils, how often batteries should be changed or how large the air holes should be. While cloud chasing, batteries are being pushed to their limits. If you do not know the things mentioned above or use a wrong battery, it can end up in an explosion. If the battery is getting too hot, stop immediately, put the device aside, let it cool down and get away from it. If you have any doubts, ask in your e-cigarette shop. As with any new sport, cloud chasing has many opponents. Many people think that this activity is ridiculous and even some cloud chasers find it absurd to call it a sport. Supporters, on the other hand, believe that cloud chasing can help to increase awareness of vaping, especially among smokers. By showing people how the vaping experience can beat traditional smoking, they hope that many will give up smoking. 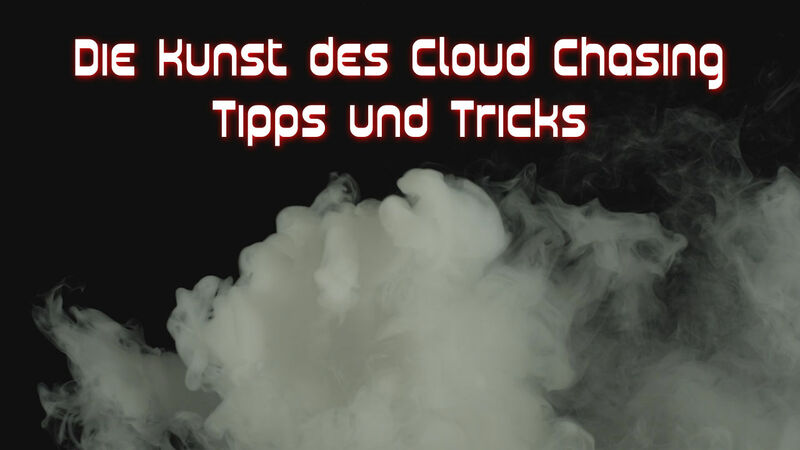 Some traditional vapers think that cloud chasing lets vaping appear in a bad light. As reasons for this, they argue that the cloud chasers, who produce large clouds in the public, show off and are provocative. And even if the smell of vapor is not bad, non-smokers still see vaping as a disturbance. The market for RDAs and sub-ohm tanks has increased tremendously and no decline is expected at the moment. So whether you love it or hate it – cloud chasing has just begun. Cloud chasing is a sport with a high fun factor and is getting more and more popular worldwide. But beware: It can be very dangerous when knowledge about technology is insufficient. Safety first! Enjoy cloud chasing and thanks for reading and sharing! If you have any questions, we are happy to answer them in a comment to this blog.